The Yelp-like match feature has made its way to iOS. Next time you use Google Maps on an iPhone or an iPad to look up restaurants in your area, try tapping their names. 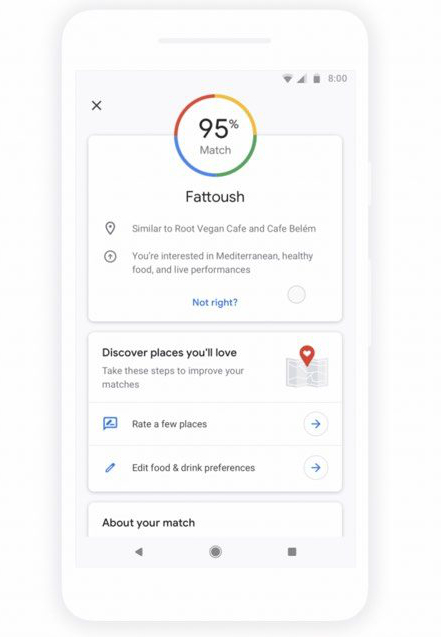 Google has rolled out Maps' "match" feature to the platform, which can predict how much you'd like a particular establishment. It's one of the Yelp-like features the big G announced for the app during its annual I/O developer conference in May, all designed to make discovering new places to visit much easier without having to access another service. Maps will use the data it has on you, including establishments you've visited in the past and your dining preferences, to display a match rate. If you like pizza, for instance, pizzerias in the area you're looking at will show a high match percentage. "Our new "match" feature will help you find your one true love. And by love, we mean your next favourite cheeseburger. Tap on a food or drink spot to see how likely you are to enjoy it based on your unique preferences – so you can spend more time eating and less time searching for places to go."